Cement board, commonly sold under trade names such as Durock, Hardiebacker, and WonderBoard, is now the standard underlayment used for ceramic, porcelain, or stone tile laid with thinset mortar adhesive. Cement board is used for most floor tile and has all but replaced plywood and drywall backer materials for wall-tile applications in wet areas, like showers and tub surrounds. Cement board forms a durable, stable base for tile, and it has no organic materials (unlike drywall, greenboard, or plywood) so it is not prone to mold, rot, shrinkage, or decomposition due to moisture. Ceramic tile laid over cement board is one of the most durable floor or wall surfaces you can install. Flooring: For ceramic tile floors, the cement board usually rests on a plywood subfloor (minimum 5/8-inch-thick exterior-grade plywood or OSB). If new ceramic tile is being laid on an existing floor, the cement board can usually be laid right over the existing floor finish, provided it is in good shape and the extra floor thickness is not a problem. 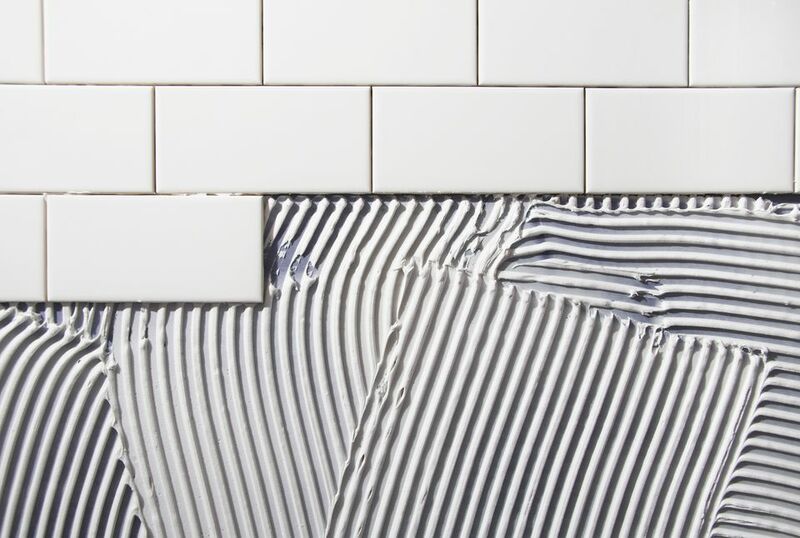 There is no need to install backer board on a concrete substrate—ceramic tile can be applied right over concrete, provided the surface is flat, smooth, and free of significant cracks. Walls: For highly wet areas, such as showers and bathtub surrounds, cement board typically is attached directly over the wall studs, and the studs may be covered with an intervening moisture membrane. (Some cement board products may not require the underlying membrane if the seams are properly waterproofed.) In such wet areas, never install cement board directly over drywall or greenboard. Instead, first remove the existing surface material, then install the cement board over the studs and membrane, as applicable. Cement board is most commonly sold in 3 x 5-foot sheets and in thicknesses ranging from 1/4 inch to 5/8 inch. A 3 x 5 panel of 1/4-inch cement board weighs about 30 pounds; a 1/2-inch sheet, 36 to 44 pounds. Larger, 4 x 8-foot panels are also available, but the heavy weight makes them hard to manage for DIYers. Floors: A 1/4-inch minimum thickness is needed, but thicker panels are also fine. Walls: Use 1/2-inch or 5/8-inch-thick cement board, not 1/4-inch. The extra thickness is needed to span the studs and provide a solid base for the tile. Countertops: 1/4-inch, 1/2-inch, or 5/8-inch-thick panels are all suitable for countertops. Use only cement board screws and alkali-resistant cement board joint tape. Standard screws and drywall joint tape will corrode or deteriorate from contact with cement board. Make a rough plan for the cement board sheet layout, based on the area to be covered and the size of the cement board sheets. The joints between the sheets should be offset by the joints in the plywood (or other) subflooring by at least 8 inches, for maximum floor stiffness. If necessary, plan to start the first row of sheets with a partial sheet to create the offset. Mix a small batch thinset mortar as directed by the manufacturer, mixing the dry powder with water in a bucket. Apply a mound of mortar to the subfloor, then spread it out in an even layer, using a 1/4-inch ​notched trowel. Cover an area just large enough for the first cement board sheet. Use the same techniques to apply mortar and lay and fasten the remaining sheets in the first row, spacing the sheets 1/4 inch apart and gapping 1/4 inch at all walls. Trim the final sheet in the first row (and make other straight cuts) with a utility knife and a T-square. Score the cement board deeply with two or three passes with the knife, using the square to ensure a straight line, then snap the waste area of the sheet back to break the board along the cutting line. Cut the fiberglass mesh along the backside of the board, as applicable, to complete the cut. To make round or curved cuts, use a jigsaw with a carbide blade or a drill and a hole saw bit. Continue installing sheets to cover the entire floor area. Remember to offset the joints between the cement board and the subfloor and to gap the cement board sheets by 1/4 inch. Mix fresh mortar only as it's needed to prevent it from drying before you can use it up. Apply cement board joint tape to all of the joints between sheets, adhering the tape with its self-adhesive backing. Mix more thinset mortar and cover the taped joints with a thin layer, using a drywall knife, similarly to mudding drywall joints. Tool the mortar with the knife so the tape is covered and the joints are flat and smooth. Allow the mortar to cure completely, following the manufacturer's recommended drying time. Installing cement board on countertops is very similar to the process used on floors, but countertops usually need a strip of cement board along the exposed edge of the countertop substrate. Cement board on walls also uses the same techniques, but in this case, there is no layer of mortar behind the cement board. Consult the cement board manufacturer for recommendations on using a moisture barrier between the board and the wall studs. This may be thick plastic sheeting or another type of water-resistant membrane.